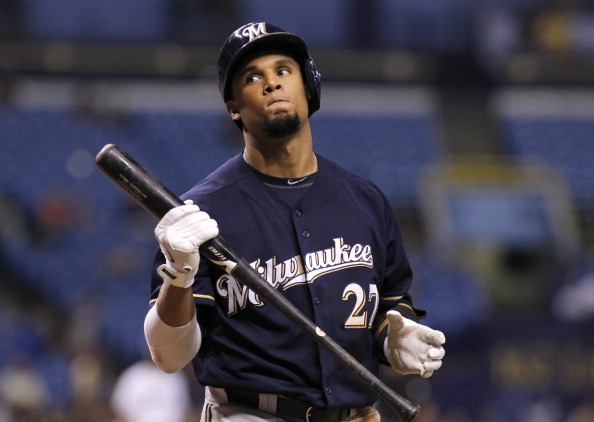 The Milwaukee Brewers will miss the playoffs after the best start in franchise history. From April 5 to September 1, the Milwaukee Brewers stood atop the National League Central standings. During a sizable chuck of that span, they also boasted one of the best records in Major League Baseball. Something special was brewing in Milwaukee. The Brewers weren’t considered a contender by many during Spring Training, but the sky appeared to be the limit for baseball’s smallest market team in the early stages of the season. The Brewers performed well in every facet of the game, and with each win, their fan base grew hungrier for the first World Series championship in franchise history. Oh, how quickly things can change. Prior to the All-Star break, the Brewers lost 11 of 12 games. They continued to unravel in the second half of the season, and their reign in the division disappeared, with the St. Louis Cardinals and Pittsburgh Pirates lurking in the rearview. The Cardinals have always been a thorn in the Brewers’ side. Despite the Cardinals’ revolving door of players, or so it seems, they manage to compete every season. They’re the class of the NL Central, no question about it. But once the Brewers ultimately fell out of first place, they had no one to blame but themselves. Their confidence from the beginning of the season was long gone. Instead, their disposition changed. They became complacent, seemingly aware of their eventual fate. They played not to lose, rather than to win. There was still hope that the Brewers could salvage the season and sneak into the playoffs as one of two Wild Card teams, but even that was too tall a task for the struggling ball club. The Brewers plummeted in the standings, losing 16 of 19 games in late August and early September. Although not yet mathematically eliminated from postseason contention, the Brewers were finished. For 150 days – a franchise record – the Brewers led the division, but their poor play down the stretch proved costly. Now they’ll be watching the playoffs from home, wondering what could have been. With Brewers season coming to a close, Wisconsin is transitioning to full-fledged Green Bay Packers mode. The Packers can learn something from the Brewers’ epic collapse, with the same aforementioned mantra: It’s not how you start. It’s how you finish. Unlike the Brewers, the Packers have gotten off to a lackluster start this season and haven’t resembled the Super Bowl favorite many expected them to be. They were embarrassed by the Seattle Seahawks in the season-opener, 36-16, and struggled mightily on offense last week against the Detroit Lions, scoring just a single touchdown in a 19-7 loss. They’re a few Jets mistakes away from being winless through three games. However, at 1-2, the Packers aren’t panicking. They’ve been in this position before – the past two seasons, as a matter of fact. Both times, they went on to win the NFC North. History tends to repeat itself, but it’s never guaranteed. The Packers must play better, plain and simple. They’re held to a much higher standard than the Brewers due to their exceptional run during the past 20 years in which they’ve been a perennial contender. In the past five years alone, the Packers have made the playoffs each season and won Super Bowl XLV in the 2010 season. That has resulted in lofty expectations. When the Packers don’t fulfill their potential, it causes an understandable sense of urgency among the fans, who have perhaps become a bit spoiled by recent success. Quarterback Aaron Rodgers only needed one word to address the fans. He was even courteous enough to spell it out. That may be the best advice of all. Packers fans must attempt to achieve perspective and realize just how good they have it. Not since Vince Lombardi’s glory days in the 1960s have the Packers sustained this much success. Championships aren’t won during the first month of the season. The Brewers found that out firsthand, and now the Packers have an opportunity to do what the Brewers couldn’t: overcome adversity, improve and make a championship run. It starts Sunday when the Packers travel to Chicago to face the Bears. 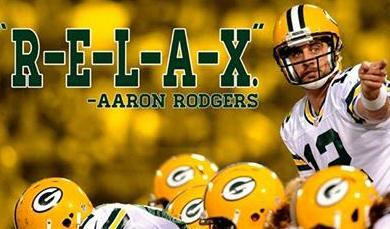 Packers quarterback Aaron Rodgers’ simple message for the fans after 1-2 start.